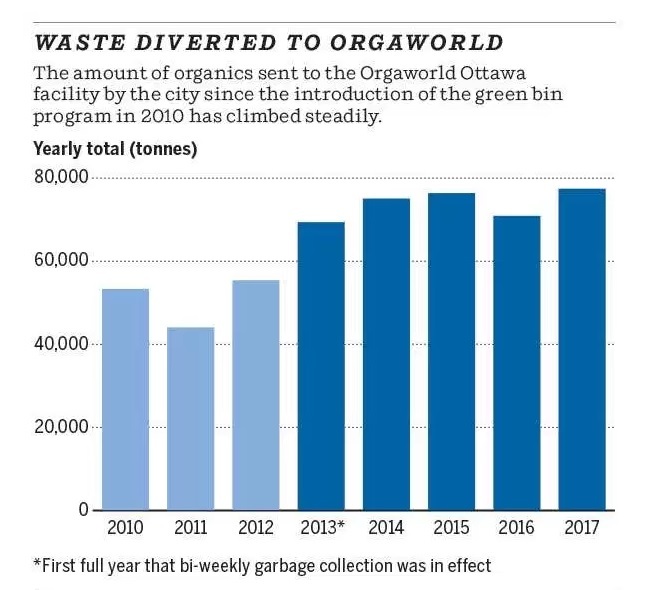 Ottawa made quite a stir last March when the City Council voted 19 to 3 to approve processing of plastic bags and doggy waste. This was a reversal of former rules that restricted both. Why did they do that and what does it mean? It turns out that we could do a better job of recycling food and garden wastes. The city reveals that only 51% of households are using the green bin. 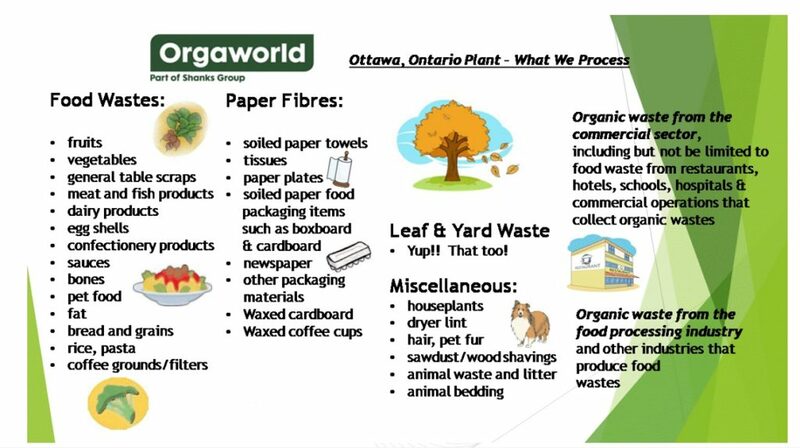 One effect of this is failing to fulfill the contract requirements with Orgaworld to furnish 80 thousand tons of material per year to their composting facility. Since the city pays for processing 80 thousand tons/year, any year that we produce less, we are wasting money. The current contract just signed with Orgaworld solves this problem in two ways: the minimum material delivered to Orgaworld has been reduced to 75,000 tonnes/year and plastic bags and dog waste has been added to the allowed green bin content. For many people, this last solution is the rub. How can plastic film (mostly polyethylene) be part of compostable material? Just to make my views clear, I am opposed to introducing more plastic film into our world. I believe that we must pay more attention to ideas that reduce the amount of plastic bags, not encourage them. Putting that thought aside for the moment, I decided that I had to understand how Orgaworld and the City of Ottawa plan to separate organic material from plastic bags in our green bins – and what will happen to the plastic bags at the end of the composting process..
Mike Leopold, General Manager of Orgaworld in Canada, told me that they have created a system to deal with it in London, ON. The green bin material from Toronto and York is processed in London and it contains both dog waste and plastic film. This same process is due to be installed in Ottawa in the fall of this year in preparation to begin operation in 2019. On the first of May, Mike and I toured the Orgaworld plant on Hawthorne Road. He allowed no pictures inside the building but I could see the green bin material brought from the city and the compost that was produced. I also saw the process of shredding the green bin contents and screening for bits of metal, hard plastic, and glass. When plastic bags become part of this green bin material, machines that slice the bags into strips will precede the shredding. Since the current green bin material contains small amounts of plastic film, that material is now also screened. The shredded material is loaded into long tunnels that appear to be about 30 metres long, nine metres wide and six metres high. The tunnels are perforated with holes through which air is forced to aid the aerobic composting process. Before the loading is completed, partially composted material is added to inoculate the tunnel contents. This material stays in the tunnel for 7 to 10 days. The composting operation must reach a temperature of 55 degrees C and maintain that temperature for 72 consecutive days. The compost is then matured another 21 days. Finally, moisture is added to the level of 40%. In the process, it is screened to remove all non-organic material (sharps) over 3.75mm in size. With the new system, it is at this point that the plastic strips will be screened out. Other screens with openings of 100mm and 10mm will sequentially screen out most of the remainder of the plastic film. Of course, these polyethylene strips will be exposed to 55oC as well as the organic material. However, polyethylene melts at a minimum temperature of 120oC so the film remains unmelted and doesn’t contaminate the compost..
During the composting process, ammonia gas is produced and it is smelly. As the ammonia-laden air is forced out of the tunnels during composting, it is piped into a scrubbing system. As the air is passed through the piping, sulfuric acid is dripped into it. A chemical reaction takes place and ammonium sulfate (NH42SO4 ) is produced. This smelly ammonium compound is captured as a liquid which is then sold as a fertilizer. This process scrubs the air and it is then exhausted into the atmosphere, almost odorless. 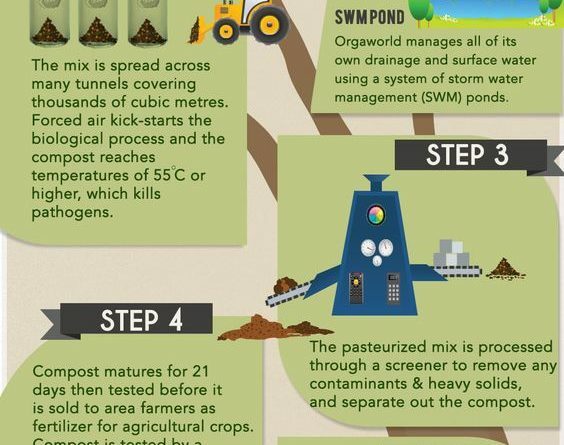 The compost is required to conform to Ontario’s regulations for amounts of heavy and toxic metals as well as plastics. Ontario requires that no more than 0.5% by dry weight of the compost is plastic. This will still apply to the compost produced from green bins next year that are expected to contain large amounts of plastic film. So where does all of the soon-to-be-collected plastic go, now that it will be separated and collected during the composting process? For the time being, it will be sent to the landfill to eventually make methane. Mike has feelers out to producers of cement who may be able to use it to fire their kilns. He has no takers yet. Plastic bags are ubiquitous. Now we’ll have some more. Millions find their way into every corner of our life. Most of us have seen the pictures of plastics taking up the area of a small country on our oceans. Animals die from ingesting them. In spite of their many advantages, I still can’t help thinking that we make the wrong choice when we allow more plastics into our world.